Yael Shahar, author of Returning talks about writing as a means of self-transformation. 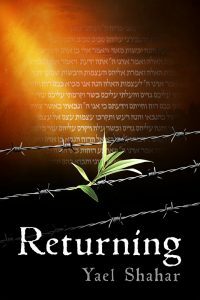 Returning tells the story of a former member of the Birkenau Sonderkommando and his journey of healing and redemption. The book is due out in May 2018. Returning must not have been an easy book to write. What drove you to write about such difficult subject matter? This wasn’t really a conventional “I want to write a book” project! Returning grew out of a deep compulsion—an obligation, really—to tell what had happened, coupled with a complete inability to talk about it. Ovadya’s story had been a part of my inner world for so long that it was eating me from within, demanding to be told; and I eventually found that the words would come out, slowly and haltingly, on a computer keyboard, even if I couldn’t speak them out loud. And gradually, the writing became a path to healing—both physical and spiritual. Once I started, the process took on a momentum of its own, taking up six years of almost full-time engagement. Only years after I started did I begin thinking seriously about trying to make what I was writing into a book—and considering my own extreme reactions to the trauma I wrote about, it was a major challenge trying to work all this into a book that anybody would actually want to read! The end result makes for quite a gripping story. A lot of the writing in Returning is strongly visual; one reader even commented that many parts of the book seem like they could be used as a shooting script for a movie with only minimal changes. Was this something you did deliberately? I don’t think it was a conscious choice. Returning is largely about memory and what memory can do to a person, but it was also written from memory—so I simply wrote what I remembered, and it turns out that my most vivid memories tend to be largely visual. To the extent that there’s technique involved, it’s mostly a matter of knowing what to leave out. I tend to be fairly minimalist, describing just the few things that pop out at me. If those are the things that stuck in my own memory, I assume it’s because they were the ones that had emotional impact and convey the essence of what happened. The rest is up to the reader to imagine. And of course, it helped that so much of what I was trying to say was hard to talk about. That minimalism works well to convey a sense of “being there”. This is particularly true of Ovadya’s memories of Birkenau. Ovadya’s writing conveys what it’s like to live with traumatic memory, with its odd juxtapositions of past and future. That sense comes through in the very language that he uses to describe his experience. He dips into memory and suddenly “was” gives way to “is”, “there” becomes “here”. This experience affected the telling of my own side of the story too: my “conventional” experiences growing up in Texas often take on a dreamlike quality, while Ovadya’s recollections of life in Saloniki and Birkenau are fragmentary, but vivid and concrete. I guess to Ovadya, Texas—and Israel too—are fairytale places, and my life is a fairytale life! So that leads to the obvious question: the book’s chapters alternate between Ovadya’s first-person narrative and your own story told in third person. Why is it Ovadya’s part that’s in first person, considering that it’s your name on the cover? Well, I did feel at first that the name on the cover should be Ovadya’s and not mine. However, a book-publicist friend pointed out that I had already established something of a reputation as a writer, and said I shouldn’t squander that. Still, in a sense Ovadya really is the book’s main author, even if I did the actual writing. Not only is the main narrative voice his; but also, it’s his desperate compulsion to bear witness that drives the story. In Returning, Yael struggles with the aftermath of trauma—the flashbacks, the need to tell, and the difficulty of evading memory. But Ovadya struggles with deeper issues: is there meaning in a world where God appears to champion evil? “Omnipotence and malice are a frightening combination!” He doesn’t ask how we should live in such a world; he questions whether it is worth living at all. And of course it’s Ovadya who is trying to come to terms with his role as a part of the mechanism the Germans created to bring about the destruction of his people. The issue of names seems to run a lot deeper than whose name is on the cover. One of the themes of Returning is the way our self-identification changes our view of the world—particularly Ovadya’s struggle with his own name. Ovadya does indeed have a very conflicted relationship with his name, partly because of its meaning—“Ovadya” means “servant of God” in Hebrew—and partly because it connects him with his life before he and his family and friends were taken away from their home in Saloniki and sent to death or enslavement in Auschwitz. His real name reminds him too strongly of all he has lost—physically, emotionally, and morally. Ovadya’s initial refusal to use his given name shows us how trauma and guilt alienate us from ourselves. “One who became a slave to the Germans can’t use a name that means ‘Servant of God’,” he says. But of course, the only way he can get out of that slavery is to reclaim his name—the goal becomes the very means to achieve it. Reclaiming his name is part of his journey back to the better part of himself: a true journey of T’shuvah, the process of repentance, which—translated literally from Hebrew—means “returning”. Returning doesn’t seem to fit comfortably into any particular genre. It reads like literary fiction, but it’s a true story. So how would you categorize the book? I’m not sure I have an answer to that one—no single genre quite fits. Ovadya’s story is told exactly as he remembers it; the conversations and correspondence related in the book actually happened. Masha’s and Rav Ish-Shalom’s words are their own; and while Don adamantly denies ever having been “insufferably smug”, you can take my word for it—he was. Although telling my own part of the story as a coherent narrative required me to take a few liberties with time, combine a minor character or two, and of course leave out a lot of people and events that played some part, I’ve stayed close enough to the actual course of events that my first inclination was to classify Returning quite firmly as a non-fiction memoir. There’s one problem, though: The whole issue of how I became entangled with Ovadya’s memories is something I have no real explanation for, and it obviously doesn’t fit into any of our conventional understandings of how the world works. Some people are going to have a hard time accepting this aspect of Returning as true, and ultimately it’s not important that they do so. The historical events Ovadya lived through are well documented, and happened as he remembers them; and the challenges he faced—and faces—are real ones. If it’s easier for someone to read Returning as historical fiction, that’s fine; just remember that Ovadya’s story is true, even if it’s difficult to understand how he came to be able to tell it. So however we classify Returning, it is a story of recovery from trauma, of guilt and atonement, of the preservation of memory…. But most of all, it’s a story of God-wrestling in the timeless tradition of Ya’akov’s wrestling match with an un-named and un-namable entity on the banks of the Yabbok river. We’ve all crossed that river at one time or another, and most of us have wished we had some way to name what we faced there. But, like Ya’akov’s opponent, the apparition vanishes in the light of reason, leaving us both wounded and blessed . . . and forever changed. For Ovadya, this God-wrestling involved taking his case to a rabbi to judge, and the story of what happened as a result forms the bulk of the book. That search for justice and atonement was his path to healing. Telling his story was mine.